Aberdeen maintained their good home run in this season's Uefa Cup with a deserved draw against tournament favourites Bayern Munich at Pittodrie. Josh Walker curled home a beautiful shot after 24 minutes to cap a bright start, but five minutes later Miroslav Klose slammed a superb equaliser. Sone Aluko then drove the Dons second in 41 minutes to rattle the Germans. Hamit Altintop spared Bayern, netting the rebound after Jamie Langfield had parried his 53rd minute penalty. Aberdeen manager Jimmy Calderwood made three changes for the task of containing the Bundesliga leaders, with Andrew Considine, Lee Mair and Aluko coming in for Dave Bus and injured pair Jackie McNamara and Derek Young. Bayern were without the injured Marc van Bommel and Franck Ribery, while Michael Rensing started in goal in place of the ill Oliver Kahn. The Bavarians were looking to avoid a repeat of their shock European Cup Winners' Cup defeat by the Dons 25 years ago. And Ottmar Hitzfeld's side, fresh from a 1-1 domestic draw with title rivals Werder Bremen, were expected to set the pace at Pittodrie. 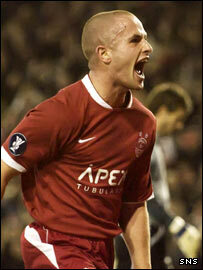 However, they found a motivated Aberdeen eager to atone for back-to-back drubbings by Dundee United and Celtic. The Dons had a good penalty claim within the first minute when Andreas Ottl handled the ball as he tried to head clear Aluko's cross. Christian Lell issued an early warning for the hosts with a powerful 30-yard strike which Langfield palmed away. But the Reds were full of fervour, and more than matched their illustrious visitors in the physical battles. Their reward arrived with the opener, through Middlesbrough loanee Walker. Aluko did well to pick up a loose ball that Bayern had failed to clear from the penalty area, before laying it off to the 18-year-old who calmly bent the ball into the corner of Rensing's net. It was a cool, composed strike from Walker on his European debut. Unfortunately for the Dons, their shock lead lasted just a few minutes as Bayern hit back with a textbook strike. A long ball from Lucio found Luca Toni, and the bustling Italian forward's assist found Klose, who instantly fired a clinical shot high into the net past Langfield. Ze Roberto cracked a left foot shot just past the target with the Germans looking increasingly ominous with their regular thrusts forward. Pittodrie was absorbed in an exciting clash, with Klose nearly netting his second, only to be denied by the busy Langfield from six yards. With Bayern clearly having underestimated Aberdeen in the first half, they were punished for their complacency when Aluko put the Dons ahead again as the interval approached. Lee Miller hooked a ball through the middle channel, and Aluko slipped past Lell before driving a left foot shot under Rensing who was slow to react. With Calderwood's men in the ascendency, the inspired England Under-19 international Aluko proceeded to shoot past the post from 25 yards. Bayern began the second half positively, and were awarded a penalty eight minutes in, when luckless Alan Maybury handled after a cross by Ze Roberto. Altintop's spot kick was well saved by Langfield but the midfielder managed to fire home the loose ball for the leveller. Steve Lovell replaced Darren Mackie with the home team's exertions beginning to take their toll. Langfield came to the rescue yet again, smothering a Lukas Podolski shot, from a move initiated by a determined Toni. Aberdeen held on against a predictable late Bayern assault - and it was more than earned, the injury-hit Dons keeping the tie alive for the return in the Allianz Arena. Aberdeen: Langfield, Maybury, Diamond, Considine, Mair, Nicholson, Walker (Touzani 87), Severin, Aluko, Mackie (Lovell 68), Miller. Subs Not Used: Soutar, Daniel Smith, Maguire, Bus, De Visscher. Goals: Walker 24, Aluko 41. Bayern Munich: Rensing, Lell (Lahm 46), Lucio, Demichelis, Jansen, Altintop, Ottl, Ze Roberto (Podolski 66), Schweinsteiger, Toni, Klose (Schlaudraff 80). Subs Not Used: Kraft, Sosa, Breno, Kroos. Goals: Klose 29, Altintop 55. Ref: Eduardo Iturralde Gonzalez (Spain).